It is hard to believe that I have already finished the first quarter of the school year. I have learned so much already that I could never have been taught in college. I'm looking forward to the start of a new quarter by changing a few of my management strategies. One thing I started doing at the end of the last quarter was having a fun activity on Friday's that only the students who did their homework all week were allowed to participate in. It was amazing how fast students would start turning in work when they knew they wouldn't be able to participate. 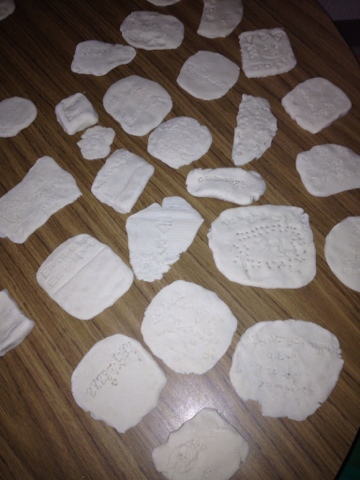 After studying writing in Mesopotamia I had students make clay tablets using the cuneiform alphabet. They really enjoyed making these and the students who didn't get to participate magically found the motivation to turn in their homework the next week. These clay tablets are super easy to make. All you need is 4 cups of flour, 1 cup of salt and 1 cup of water. Mix it all together and mold it into dough form. I had my students use toothpicks to write on the clay with. We then let them dry on my back table for the weekend. Another thing I'm looking forward to trying is Class Dojo. It's an online behavior management system. I will post more about it once I have tried it with my students.